U of A engineering students recently got a first-hand look at the economic aspects of engineering as part of an engineering economic analysis course at the U of A Rome Center. In addition to typical classroom-based coursework, students took part in a variety of site visits. 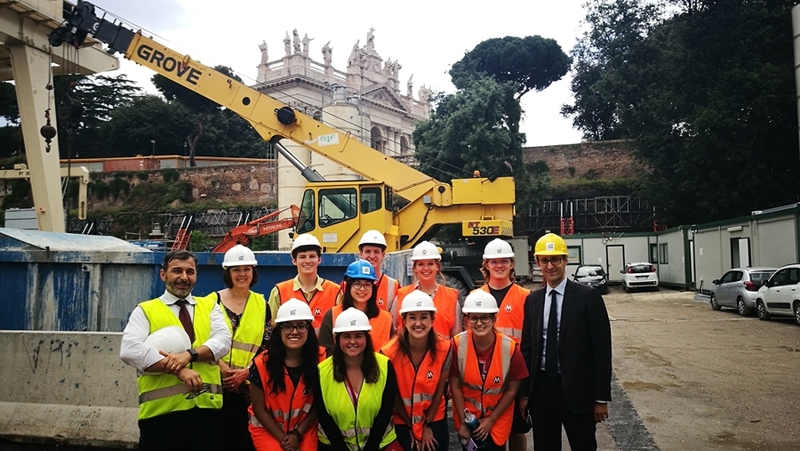 A tour of the excavation of Rome's newest subway line proved particularly interesting for students. Since the excavation began in 2007, multiple archeological discoveries have been made. The construction has unearthed second-century military barracks, a second-century home of a military commander, and rare wooden artifacts. The historical discoveries have led to additional costs and construction delays. Before visiting the excavation site, students conducted an analysis of the project's goals, timeline, costs, and anticipated benefits. During the visit, the site's engineers discussed with the students how the initial project plans have had to be adjusted throughout the construction process. "I wanted students to explore the economic costs and benefits associated with a large, publicly-funded project," said Tish Pohl, clinical assistant professor of industrial engineering and the course's instructor. "During the visit, students saw how the excavation work is being done, the technology used, and how much care has been taken to ensure no damage is done to surrounding buildings, many of which are ancient." The engineering students also visited a travertine quarry. While there, they saw the process by which the stone is extracted and transformed for use in the construction of buildings around the world. Additionally, students toured a modern factory that produces bathroom fixtures. The tour gave students an inside look at the engineering processes and economic considerations used in modern manufacturing. Students in the course benefited from the comprehensive experiences offered at the Rome Center. "Studying at the Rome Center allowed for a very personal and focused classroom experience," said Patrick Dougherty, an industrial engineering sophomore. "The addition of site visits to supplement the course was a welcome enhancement that I would not have gotten to experience in Fayetteville." Their time in Italy also allowed the students to build strong connections with their peers, which they will continue to strengthen in Arkansas. "My favorite aspect of my study-abroad experience was becoming close friends with my classmates," Dougherty said. "I'm looking forward to seeing everyone again in Fayetteville." Students interested in learning more about studying abroad at the U of A Rome Center should contact the Office of Study Abroad and International Exchange.